IMAGINE what it would be like if you could MAKE yourself happier in just five minutes a day. First, think about how you are feeling right now. On the Happiness Scale below, circle the number best matching your level of happiness, right now. Now, think about how you would like to be feeling after this exercise. Be realistic. For example: If you have just experienced a trauma or are experiencing grief and loss etc. it is important for you to understand there are times when it is normal to feel sadness. If you need someone to talk to, learn how I can help you further. If you need to speak to someone right now, call LIFELINE 13 11 14. This exercise is a tip for when you just need a lift, a shift in your mood to get through your day. Like that meeting with a client/boss or outing with friends. When we’re happy we smile. We smile at people when we meet them because we are feeling happy. We talk to people more, we are more likely to participate in things we enjoy – sports, hobbies, socialising, work. But what do you do when you are feeling sad? What if you are not feeling happy? What if you just feel blah? There is a solution that will help you feel happier, when you arrive at the office. A proven neuro-skill, you can learn and use to feel happier any time, any where. A simple solution, proving that faking it ‘til you make it can make you feel happier, right now. Let’s say you rated yourself on the above test at a 1. Okay, so you’re feeling pretty unhappy right now but, you are going to meet up with friends and just need to shift your mood before you arrive. You don’t want to be the one to bring the mood down. You want to feel happier. Makes sense, we all want to be happy. So here’s how. Grab a pen and a mirror. Put pen in your mouth – sideways – like a dog with a bone. Looks pretty funny right? Okay, so you are almost there. Hold the pen there for and notice the expression on your face. Take a look in the mirror. 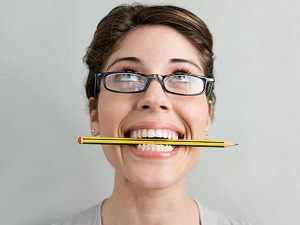 Notice that by holding the pen in your mouth, your face is mimicking the same expression you make when you smile. Take another look in the mirror. Now, really, really focus of holding that position and at the same time, exaggerate that smile. Get your eyes in on the action as well. Continue to hold this expression and smiling with your eyes for as long as you can. Anywhere between three to ten minutes. Notice how you are feeling after several minutes. ON the scale below circle how you are feeling now. Notice that you have shifted your move one or two, perhaps more points on the scale towards happiness. Continue this exercise as and when needed. You now have learned a valuable neuro-skill you can practice wherever and whenever you need. I love this exercise; it’s one of Mark Waldman’s recommendations and top neuro-tip for shifting your mood. It’s a fun exercise to do in the car while driving to work. Check your level of happiness on the scale. NB: ignore the frowns from the other drivers. I like to think of it as – Fake it ‘til you make it! Your brain detects your facial muscles are smiling and thinks, “I’m smiling so I must be happy.” (David Ludden PhD- Talking Apes). Emotions are infectious. Notice, when you walk into a room, workplace, school, restaurant others cannot help but return your smile, with a smile. This makes you feel happy. Strack, Fritz; Martin, Leonard L.; Stepper, Sabine (May 1988). “Inhibiting and Facilitating Conditions of the Human Smile: A Nonobtrusive Test of the Facial Feedback Hypothesis”. Journal of Personality and Social Psychology 54 (5): 768–777. doi:10.1037/0022-3514.54.5.768. PMID 3379579.